Survey is made up of more than six thousand vintage postcards depicting Niagara Falls. 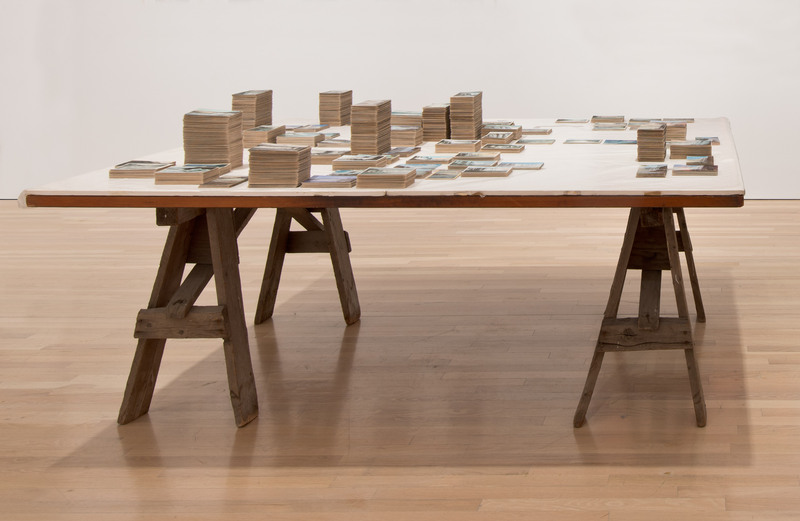 From afar, the work looks like an architectural model of a cityscape, but seen at close range, the postcards align to create an unusual map of the falls. In her presentation the artist shows that souvenirs such as these are mass-produced and yet experienced singularly. Representative of both geographic site and absent sender (as well as receiver), the postcards too represent a site while also marking the distance from it. "Survey." Take It or Leave It: Institution, Image, Ideology Digital Archive. Los Angeles: Hammer Museum, 2017. https://​hammer.ucla.edu/​take-it-or-leave-it/​art/​survey/​.